The Rotterdam Rules - CHADWICK WEIR NAVEGACION S.A. I thank the Uruguayan Maritime Law Association (UMLA – AUDM) in the person of respective President, Dr. Alejandro Sciarra, for the invitation to take part in this Conference, presenting the subject: Shipowners’ and P&I Clubs’ views with regard to the Rotterdam Rules. While we look at some images showing the heavy weather conditions encountered many times by the ocean-going vessels, what our law would rarely judge that same represent an exoneration cause due to force majoeur, let’s say that the United Nations’ Convention of Contract for the International Carriage of Goods, wholly or partly by sea, commonly known as the Rotterdam Rules, was adopted by the General Assembly of the United Nations on December, 2008, and was signed until now by 21 countries: United States, France, Greece, Spain, Denmark, the Netherlands, Norway, Poland, Switzerland, Armenia, Cameroon, Gabon, Congo, Guinea, Madagascar, Malí, Níger, Nigeria, Ghana, Senegal and Togo. The Convention will enter into force 12 months after ratification by at least 20 countries. It is fair to recognize that, up-to now, the Convention has not been ratified yet by any of the signatory, neither by any other country which could have adhered further. It must also be pointed out that the Convention is the result of many years of negotiations by the UNCITRAL (United Nations Commission on International Trade Law), which despite its technical character, it takes part of a political organization as the UN, what explains certain considerations which are not strictly technical and represent concessions to countries with international political influence. For instance, the exemptions in the matter of ―volume contracts‖, the subsidiarity granted –if corresponding- to the international Conventions ruling the inland truck, railway and air modes, and the discretion granted to the Estates to adopt or not the jurisdiction and arbitration chapters. The Convention is best described as a ―maritime plus‖ instrument, since same is designed to legislate both for international maritime carriage of goods, and for international multimodal carriage of goods, where a maritime leg in the carriage contract is provided. We anticipate the conclusion that this Convention does not generate enthusiasm among Shipowners and respective P&I Clubs, and neither same is, as said in some forums, a new attempt to favor the big sea carriers against the holds’ users. We will try to demonstrate that this new Convention, to the contrary, means a significant increase of carriers’ liability, among other aspects, due to the loss of the traditionally existing defences, the increase of obligations in periods and areas more extended than present, by the increase in limits of liability, and the extension of the contractual liability. Of course this may sound curious, if we merely observe from the perspective of the Uruguayan law, that almost implies a strict liability regime, without any chance for carriers to limit liability, to reasonable values to give effective protection, but not exceeding non-viable levels to insurers. Notwithstanding, we should recognize that Uruguay is not the centre of the universe neither, in this nor in other areas, and that both the national law for the international sea carriage, and the interpretation made of same by Uruguayan Courts, are not the general rule in the rest of the world, so –although not for Uruguay- the limits and liabilities in the new Convention imply, in most of the countries, a sensible increase with regard to the existing. To illustrate what aforementioned, we will compare the Carriage of Goods Conventions presently in force in most countries in the world, i.e. the Hague-Visby Rules and the Hamburg Rules, with the projected Rules of Rotterdam. The new Convention applies to all the contracts in the liner trade but excludes charter parties, and any other contract for the use of space onboard a ship. Non-liner trade is not included in the Convention, except when there is no charter party or other contracts for the use of a ship or a space onboard, and a transport document or an electronic transport record has been issued. The Convention has also a very broad geographic scope of application with regard to international contracts of carriage with an international maritime leg, and where the place of receipt, loading, delivery or discharge is placed in a contracting state. The Rotterdam Rules adopt a more complete combination of the application criteria than the former Conventions, namely the documentary of the Hague-Visby, the contractual of Hamburg, and the geographical and commercial of both. While according to the Hague-Visby Rules , the carrier’s period of responsibility commences when the goods are loaded until they are unloaded from the ship, and the Hamburg Rules extend the carrier’s period of responsibility to cover from the port of loading to the port of discharge, the Rotterdam Rules impose liability to the carrier until the goods are delivered to consignees. The new Convention includes other modes of transports in its definition of a contract of carriage. In addition to sea carriage, stevedores’ services, terminals, road, river and rail transport, are included. The Rotterdam Rules goes beyond the definition of carrier’s identity than the previous conventions, because apart from defining the performing party and the maritime performing party, same conceptualizes the carrier so broadly, that this condition comprises other modern players in transport, such as freight forwarders and logistic operators. This inclusion introduces a multimodal aspect, that distinguishes the Rotterdam Rules significantly from the existing current conventions. With regard to jurisdiction and arbitration, the Convention provides the plaintiff with the right to initiate judicial proceedings/to choose place of arbitration in the following locations: the domicile of the carrier, the place of goods’ receipt, the place of goods’ delivery, or the port of loading or unloading. The aforementioned choices are limited if there exists an exclusive jurisdiction clause in the contract of carriage. These clauses of jurisdiction and arbitration are optional for each member state and in case of not accepting same, its application is to the discretion of national Courts. The Rotterdam Rules provide for a more extensive liability for the carrier than the current Hague, Hague-Visby provisions in the obligation of making the vessel seaworthy. According to the Hague-Visby such obligation was limited to before and at the commencement of the sea voyage, while the Rotterdam Rules impose to keep the vessel seaworthy also during all the voyage. The Rotterdam Rules preserve the catalog of exceptions fixed by the Hague-Visby with three significant alterations: the exception of error in navigation and management of the ship is deleted, the too general ―any other cause‖ is removed, and the fire defence becomes weaker, since the carrier cannot appeal to same if the fire is attributable to the crew, its servants, or any performing party in accordance with the RuIes’ definition. On the other hand, the Rotterdam Rules include additional defences, among others, the possibility of exonerate responsibility in case damages would be caused to avoid or attempt to avoid damage in the environment or, save or attempt to save property at sea. If compared with the Hague-Visby Rules, the limitation of liability has increased from 666,67 SDRs per package to 875 SDRs, and from 2 SDRs to 3 SDRs per kilogram. As in former Conventions, the limitation will not be applicable if the value of the shipment has been declared by the shipper and the carrier has issued an ad-valorem bill of lading. There is also as in the Hamburg Rules, a provision on liability for delay in delivery, which was not included in the Hague-Visby. As an advantage in clarification and elasticity of operations, the Convention states the conditions to carry the goods on or under deck, avoiding so the legal difficulties that the general exclusion for carrying the goods on deck implies, as per the Hague and Hague-Visby Rules. Last but not least, the Rotterdam Rules state a fairer burden of proof system for both parties: cargo and carrier’s interests; in the spirit of modernization, the Rotterdam Rules recognize electronic transport records; there is freedom of contract with respect to ―volume contracts‖, and there arise a new concept of ―maritime performing party‖, which includes responsibility of stevedores, ports, terminals, agents, freight forwarders, NVOCC, etc, who perform their activities within the port area. Although the new Convention will increase shipowners’ liabilities and, consequently, of respective P&I Clubs, in doing so it offers very good prospects for updating the international sea law in a uniform approach across the world. The shipping is a global industry –90% of world trade is carried by sea—and needs, therefore, to be governed by truly and internationally accepted rules across all the jurisdictions, in order to provide with legal certainty and uniformity, thereby reducing conflicts of different rules which increase the insurance costs and, in fact, those of final users of carriage services. In this sense, notwithstanding the additional costs to be involved, the P&I Clubs support the approval of the Rotterdam Rules, with the purpose of reaching the up-dating and uniformity of the international sea law. Although strictly out of scope with regard to my speech, I would like to concisely express the possibilities that, in my own opinion, this modern Convention offers to our country. A conformist and conservative view could be to think: let things as they are that with the sea law in force, originated in the XIX century, the growth of ports has been maintained anyway. This view suffers, in my opinion, from two errors: firstly, it ignores the effect of a modern law –as now the Rotterdam Rules and opportunely the Law of Ports in 1992—can produce on the efficiency of national ports. The governmental and private investment facilitated by the called Law of Ports, has created the necessary conditions to develop the ports activities, with international standards of quality, productivity, safety and competitiveness. The approval of this new international rule could increase exceptionally the traffic of vessels in our ports. Secondly, it undervalues the potential that the fact to harmonize the national law to the international one can offer to our country, and put same in line with ideas, needs and interests of present times. ―The Commerce Law of the Republic reduced to the antique By-Laws of Bilbao, and to some incomplete and scattered laws of the Codes in force, in the innumerable cases as offered by trade great development in the current century, is lacking of laws and principles, obligations and rights arising from business’ acts, with great prejudice to traders and great obstacle to the judges who are committed of taking decisions inf commercial causes‖. ―Just looking at our nautical chart, it is appreciated all the influence of the trade in future destinations of the Republic and its nature, with the aim of helping and favoring it, by means of a law appropriated with its needs of situation and development‖. Mutatis mutandis, those expressions could be perfectly applied to the obsolescence of our sea law today and the need to up-date it. If the Rotterdam Rules of 2009 would be a too ambitious step following our current Code of Commerce of 1866, then we will coincide curiously with our colleague in the panel, Dr. Julio Vidal, who as co-author with other well-known jurists, wrote in an article published on past April, 2010, entitled: ―Particular Concerns with regard to the Rotterdam Rules‖, obviously in criticism of this Convention. ―Why reinvent the wheel? …With less than 20 articles, the Hague-Visby Rules have been a very long lived and successful Convention and Protocol … These 4 Conventions (referring to The Hague-Visby, Montreal, the CMR Convention for the international carriage of goods by road and the CIM-COTIF Convention for the international carriage by rail), have been long tried and tested and work well with many countries across the globe. However, the main merits of the Rotterdam Rules –the deletion of the error in navigation defence and introduction of the electronic record—could easily be saved by protocols to the existing maritime conventions‖. As another alternative, we should not disregard the ―Argentinean‖ solution, i.e. to tailor an International Convention as the Hague-Visby, already tested and in force in countries with more shipping experience than ours, or inclusive the Hamburg or the Rotterdam Rules, adapting to our common practice and idiosyncrasy those controversial points as limitation of liability and causes of exoneration. Anyway, we believe same could be improved, the Estates could avoid them for some time and some of the involved parties could resist their application, but these Rotterdam Rules are aligned with the multimodal system, with a balance of the modes of transport and with a fair relationship between the interests of carriers and cargo, for which –not even just the letter- but the spirit of the proposed Convention will finally prevail. To end-up, the Latin proverb ―Navigare necesse est, vivere non necesse‖, in general attributed to the Roman General Pompey when trying to convince some sailors who denied to embark during a severe storm, is employed as known by all of us to refer to the unavoidable duties, more important than the own life. Another interpretation would mean that it does not suffice the mere existence but it is necessary to create and modify the condition of things to try reaching the perfection, ideality and transcendence. Today’s Conference is doubtlessly a very important first step, for which we must thank very much to its organizers. – Text of the Convention of Contracts for the International Carriage of Goods wholly or partly by Sea (The Rotterdam Rules official website). 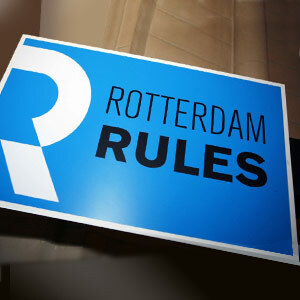 – Questions and answers on the Rotterdam Rules (The Rotterdam Rules official website). – The Rotterdam Rules – A position paper by the International Chamber of Shipping (The Rotterdam Rules official website). – What impact will the Rotterdam Rules have on your liability? By Maya Linkinoska, Marc Duck, Chao Wu – UK P&I Club legal briefing – September, 2009. – Rotterdam Rules – A General Overview by Joakim Andersson – The Swedish Club Letter 1 -2009. – Pros and Cons of the Rotterdam Rules, by Dr. Ariosto González; paper to the Iberoamerican Maritime Law Institute, July, 2010. – The Rotterdam Rules – Some elements for analyzing the convenience or inconvenience for Latin America ratification by Dr. José Vicente Guzmán (Colombia), Paper to the Iberoamerican Maritime Law Institute, July, 2010. – Volume contracts: its regulation in the Rotterdam Rules, by Dr. Jorge Radovich (Argentina). Speech to the Argentinean Maritime Law Association, April, 2009. – Particular concerns with regard to the Rotterdam Rules, by Dr. José Alcántara, Dr. Julio Vidal and others, April 2010.